You know you can run a 5K. Maybe you’ve already finished one. But a 10K? It has a notch-up-from-novice feel that’s appealing, a true distance quality. But you are a new runner, so you wonder—should I? If you’ve covered at least 2 miles, 3 to 4 days a week, for 2 months, the answer is: Heck yeah. The 10K is where endurance fun begins. It propels most new runners into uncharted, but highly rewarding, territory: Up to 60 minutes of running. Hitting that hour mark will push your cardiovascular fitness skyward and increase leg strength (not to mention give you an excuse for a victory dance). Plus, the added endurance can also boost your 5K time and lead you to longer races like the half and full marathon. To do it safely, follow our 10K plan for beginners, below, was created by Andrew Kastor, coach of the High Sierra Striders in Mammoth Lakes, California. 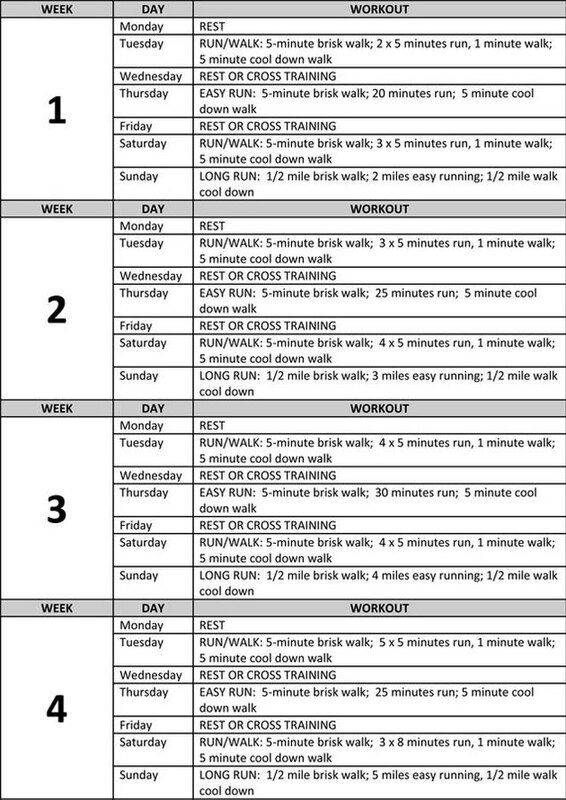 This 8-week program strikes an ideal balance between building aerobic endurance and prioritizing injury prevention by mixing bouts of steady running with run-walk workouts. “Walk breaks are simply the best way to build running safely because they reduce stress on the ligaments and tendons,” says Kastor. The run-walks also add to your overall endurance. The continuous runs, which progress from 2 to 6 miles, train the body to “go long”—that is, they’ll get you to the finish line without walking. 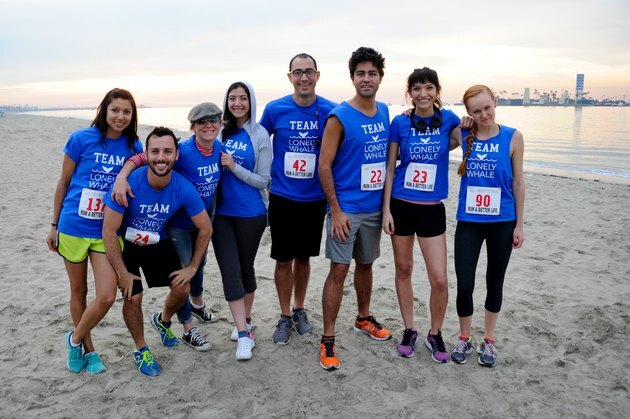 YOUR GOAL: Finish your first 10k without walking. YOU’RE READY IF: You’ve been run-walking at least 2 miles, 3 to 4 days a week, for 2 montsh. TIME VS. MILES: You’ll run by time for most of the workouts, so all you need is a watch. Your weekend long run is in miles. The workout will help you develop a sense of your pace per mile and let you rest assured that you’ll be able to cover the distance on race day. WARM UP/COOL DOWN: Start and end each run with a 5-minute walk. Walking not only prepares the body for running and cools it down afterwards, but it increases time on your feet, which extends your endurance, says Kastor. INTENSITY/PACE: Do every workout at a comfortable, conversational pace: 60-65% of max heart rate, or a 5 on a rate of perceived excursion scale (of 1 to 10). “Faster, harder running increases injury risk”, says Kastor. Finish the distance first; then once you’ve got 6 months of running on your legs, you can aim to finish it faster. RUN/WALK: “2 x 5 minute run, 1 minute walk” means you’ll run for five minutes, walk for one, then repeat. “3 x 5” means you do that three times. Keep the walk brisk but don’t skip it; they make adapting to running safer and more enjoyable. 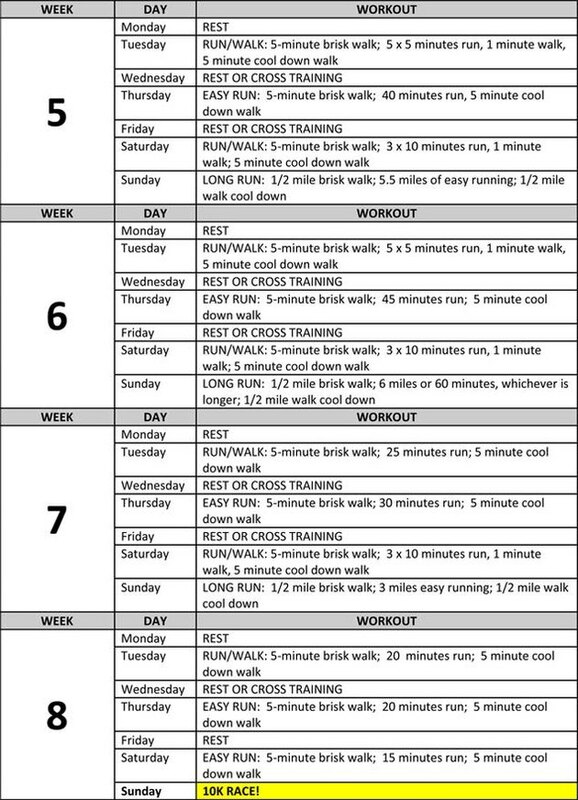 EASY RUN: Steady, continuous running done at an easy pace. If you’re winded or having struggle getting through it, just slow down—the pace that gets you through is the right pace. LONG RUN: Long runs are the big daddy of distance running, the critical workout that develops endurance. If a nearby bike path has mile markers, you’re golden. If not, find a track (4 laps equals a mile), measure a mile in your car, or use U.S. Track and Field’s mapping tool (usatf.org/routes). REST/CROSS TRAIN: A rest day means no workout—kick back and enjoy, knowing that it’s during this down time that the body heals and gets stronger. On cross-training days, stick to non-impact options like yoga, swimming, cycling, or light weight training. The added exercise will boost your running. DAYS OF THE WEEK: Training has to fit into your life, so switch out the rest and running days as work and family commitments demand. Try to keep the rest days spread out over the week though; in other words, avoid running four days in a row and resting for three.